UUMAN’s Music Program supports and nurtures a dynamic and transformative music ministry with the uplifting, healing, joyful, and transcendent power of music to unify and inspire our community. 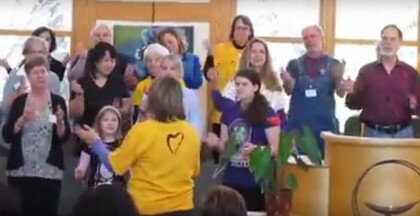 We strive to: Promote the importance of music within our congregation, coordinate with and support our Music Director and staff, seek feedback from the congregation, augment our religious services and spiritual lives with music, and provide opportunities for musical growth and participation at all levels. Our meetings are open to anyone interesting in attending. We would love to have you attend if you are available to share ideas. The UUMAN Chalice Choir is an adult choir whose repertoire spans many genres including classical, contemporary, musical theater, and gospel music among others. We provide music on most Sundays. All are welcome to join or attend anytime as our singers range from beginner onwards. Our music director’s compassionate and educational rehearsals (Wednesday evenings 7:15 p.m. and Sunday mornings 9:00 a.m.) focus on developing sound technique; nurturing the expressive, liberating, and healing experience that is music; and building an ensemble premised in love. Our accompanist’s imaginative, insightful, and warm and fuzzy spirit imbues our collective sound with kindness supreme. If you have ever wanted to learn to sing or to share your already developed voice, there is a cozy chair awaiting your arrival. There really is nothing like pouring one’s heart out in a massive crescendo lifting and being lifted in passion abundant only to follow with a melody so gracefully sublime—so beautifully honest. Ah, yes. This is what we strive to do. We are comprised of singers and instrumentalists, elementary age through high school, who want to co-create music together. Our music reflects the music of more recent generations. The music is specially arranged to both accommodate the abilities of our members and to create an effective ensemble for the services in which we perform throughout the year. As expressed in our Unitarian Universalist principles, we strive to build a team founded on kindness, acceptance, personal growth, and most of all, having fun! UUMAN’s multigenerational Family Choir is open to anyone who enjoys singing, playing instruments and making a joyful noise! This fun-loving and high energy group rehearses downstairs in Fellowship Hall Sundays 9:45 a.m., and sings in worship services on an occasional basis. No musical experience is required, and we’re open to all ages. (Very young children should bring an adult along.) We love to sing fun warm up/movement songs and perform a wide variety of music from all genres. We may even surprise the congregation with kazoos or dance moves! Our schedule varies by session and can be found in UUMAN announcements. Come check us out – we’d love to have YOU join us!